Everyone loves a sweet treat but what if it also happened to be low sugar and packed with a bunch of micronutrients. Win-win? This chocolate mousse does exactly that making it good for breakfast or dessert. It combines the versatile avocado and the rich, nutrient bomb that is cacao. Topped with another superfood like blackberries/currents/raspberries and you have an incredibly nutritious but also delicious meal or snack. Whilst this recipe uses a naturally sweetened protein powder to add both the chocolate element and sweetness, it can be substituted for a few extra tsps of cacao powder and honey to taste. This does, however, make it less low carb and sugar but still delicious. Split the avocado into two and remove the stone. Slice and scoop out the flesh into a food processor. If you’re desiring a sweeter dessert or removing the protein powder for more cacao, add 1-2 tsp of honey as well. If you added honey, briefly blitz in the food processor the avocado and honey until it is combined. Add the protein powder, cacao, salt and vanilla extract into the food processor and then blend until combined into a smooth mousse. Pause and scrape the sides to ensure everything is well combined if needed. 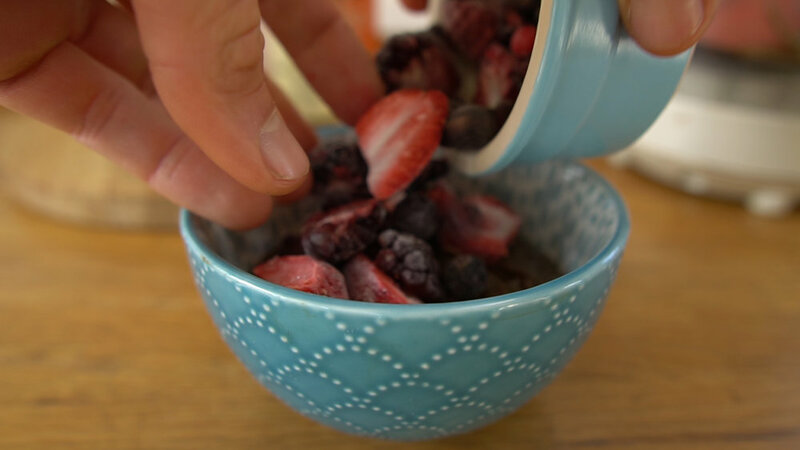 Pour the smooth mixture into a serving bowl and enjoy plain or add any topping of choice. I personally went for mixed frozen berries (for the added crunch) and a drizzle of almond butter. Enjoy!